Bangalore restaurants- Food and Travel: Miller’s 46 – Yeeeehaaaaa!!!! For the evening we had a round of beers while Preethika (our vegetarian connoisseur at this meal had the Toothless Shark which was orange juice with a dash of lime juice, grenadine and crushed ice. 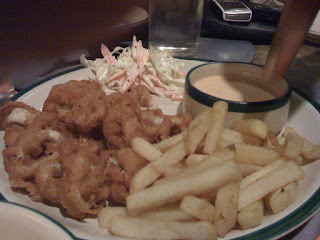 For starters we ordered the Fried Calamari which came with French fries, coleslaw and a mayo dip. The coating was great whereas the calamari was a tad chewy. 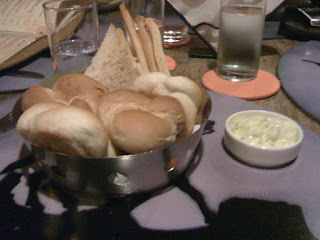 An assorted bread basket with a garlic mayo dip comes complimentary to each table. For the main courses we all opted for sizzlers. 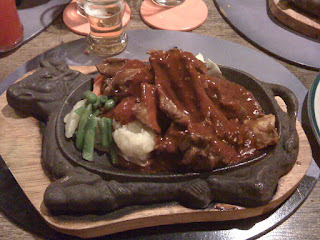 Sudhakar ordered the 46ers veal chops which was served with mashed potatoes and boiled vegetables. The chops were soft and succulent and were dunked in a heavenly tomato based sauce. 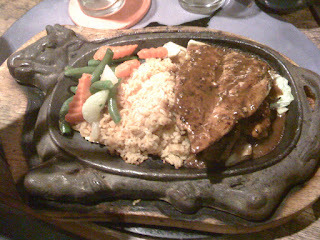 Pavan ordered the Pepper chicken steak which was a fillet of chicken breast, well done with barbeque sauce and which has boiled vegetables and fried rice on the side. 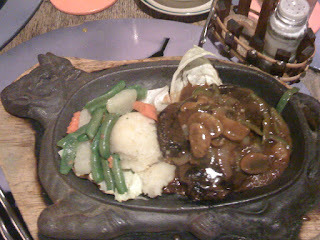 I went for the smothered steak, which was beef steak smothered with a brown sauce of mushrooms, onion and capsicum. This came along with mashed potatoes and boiled vegetables. 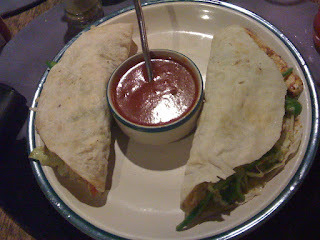 Preethika had the vegetarian fajitas which came with a tangy sauce as accompaniment. For Anoushka (yes we have started ordering meals for her as well) we ordered the kiddie steak with French fries which was a fillet of chicken in a tomato based sauce with French fries. We all found our respective meals to be good and filling. While the food here is good, it’s the ambience that can be a put off. The place is done up well but the seating is arranged quite close and the place tends to get loud and noisy. It also get a bit smoky considering that you are allowed to smoke here. Baby seats are available and the loos for a common entrance which can be a bit confusing. This meal with the beers cost us around Rs 2000 but in the end it was well worth the money. It would be advisable to book your table if you plan to visit on the weekends.